Whether you suffered a broken leg or a fractured wrist, if you have ever broken a bone, you will no doubt understand the pain that this type of injury can cause you. You will also understand the inconvenience they can cause while the break or fracture is healing. Fractured and broken bone compensation claims can be made if the accident was caused by somebody else. Here at Advice.co.uk we have experts who can provide personal injury victims with the information, advice and no win no fee service they need to seek compensation for their injuries. We are here to answer your questions such as “how much compensation will I get for a broken arm?” and to help you get the settlement you are eligible for. You can get in touch with our team of specialist advisors on 0161 696 9685 when you’re ready. If you would like to know more then read this guide which provides all of the information you will require to begin a claim. What Damages Can I Claim For After A Fractured Or Broken Bone? What Is A Fractured Or Broken Bone? What Is The Difference Between A Break And A Fracture? When Can I Make A Claim For A Fractured Or Broken Bone? How Long Do I Have To Claim For A Break Or Bone Fracture? Broken bones (or fractures) can be caused by many different types of accidents and, providing somebody else caused the accident, could be a valid reason to make a compensation claim. If you are considering seeking compensation for fractures or broken bones and want to find out the answer to questions such as “how much compensation will I get for a broken foot“, then this guide will provide you with all of the information you will require. 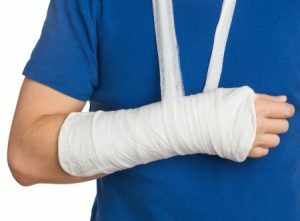 This including looking at the different types of broken bone accidents that can occur, complications that can happen following a fracture, personal injury claim time limits, what evidence you’ll need to make a claim and how Advice.co.uk can connect you with experienced personal injury solicitors that offer a no win no fee service. Keep reading to find out how much fractured and broken bone compensation you’ll be able to claim for different injuries such as a fractured foot, fractured collar bone, a broken arm and many other types of fractures. Some of the most common questions we’re asked are “How much compensation will I get for a broken foot?”, “How much for a fractured ankle?” and “How much compensation for a broken arm?” and the truth is – it’s difficult to say without knowing the details of your specific injury or claim. There’s no such thing as a 100% accurate personal injury claims calculator for the simple fact that every single accident and injury is completely different. How much compensation you could be awarded for a broken arm may be much more than what you would get for a broken finger. When you’ve spoken with one of our team, they will be able to provide you with an estimate of what you may be eligible to claim, once they have understood the full impact of your injuries. Fractured finger Severe Up to £32,210 Awarded for a severely fractured finger or fingers which result in symptoms such as impaired function, loss of feeling, reduced usage and partial amputation. A broken knuckle may fit into this,but could be at a lower amount. Fractured little finger Severe Up to £32,210 Awards for each finger or fingers may be the same as outlined above. Fractured thumb Minor Up to £3,460 Minor fractured thumb which will heal within six months. Fractured hand Moderate £5,110 to £11,640 Moderate fractured hand injures, such as a crush injury. £6,510 Example injury break or fracture - uncomplicated Colles’ fracture. Scaphoid fracture Very minor £3,090 to £4,160 Very minor wrist fracture. May include a scaphoid fracture. Fractured elbow Minor to moderate Up to £11,040 This category will include simpler and less complicated fractured elbow injuries. Or other similar injuries. Fractured humerus Serious £11,200 to £16,830 Serious fractured humerus injuries will leave the victim with restricted movement through the shoulder. Fractured radius Less severe £5,810 to £16,830 Simpler injuries to the forearm such as a less severely fractured radius, one of the larger forearm bones. Fractured shoulder Serious £11,200 to £16,830 A fractured shoulder could cause long term problems. Fractured rib n/a Up to £3,460 Causing pain and discomfort over a period of weeks. Fractured cheekbone Serious £8,940 to £13,840 Serious fractures to the cheekbone with lasting consequence, such as some disfigurement. Fractured jaw Very serious (i), (ii) and (iii) Up to £39,940 Settlement depends on severity of fractured jaw, level (i), (ii) or (iii). Most serious will have long term consequences such as arthritis and a restricted ability to eat. Damage to teeth n/a £7,650 to £10,010 Loss of or serious damage to several of your front teeth. Fractured neck Severe (iii) £39,870 to £49,090 Severely fractured neck injuries (or similar injuries) could lead to disabilities or chronic conditions. Fractured spine Severe (iii) £39,870 to £49,090 A fractured cervical spine could lead to a severe disability such as loss of function and severely reduced movement. Fractured vertebrae Moderate (i) £24,340 to £34,000 Such as a compression or crush fracture. Risk of constant pain as a result of this type and severity of injury. Can have other long-term effects. Shoulder injuries (inc scapula injuries) Moderate to severe £2,150 to £42,110 Can include a variety of shoulder injuries, including fractures of the scapula and other bones in the shoulder. Back injuries, such as a fractured coccyx. Moderate (i) £24,340 to £34,000 A fractured coccyx (tailbone) may fall into this category and could lead to a variety of symptoms and effects. Fractured pelvis Severe £68,740 to £114,810 At this level of severity, it will include extensive fractures to the pelvis. Effects may include residual disabilities in the pelvis. Fractured pelvis - inc fractured pubic rami Severe (ii) £54,280 to £68,740 Injuries here can include a fractured pubic rami which can affect sexual function. Not as severe as most serious injury bracket. Fractured hip Severe £34,340 to £46,040 This can include a fractured hip which results in a you needing a hip replacement or a similar level of injury. Fractured leg Severe (iii) £34,340 to £46,040 Injuries could include a fractured neck of femur injury or a fracture of an arthritic femur. Fractured leg Moderate (ii) £7,990 to £12,350 A simple fractured femur injury. There will not be any damage to the articular surfaces. Fractured leg Moderate (iii) Up to £10,380 Injuries in this bracket will include a simple fractured tibia (shin bone) injury. Could also include a fractured fibula or similar soft tissue injuries. Fractured knee Knee injuries - Severe (ii) £45,700 to £61,140 Leg fractures which extend into the knee joint and result in a fractured knee joint. Severe injuries resulting in long-term consequence saffecting agility and mobility. Fractured knee Knee injuries - Less severe £22,960 to £38,120 Injuries causing damage to the kneecap (patella). Can also include a variety of other injuries to surrounding tissues in the knee. Fractured foot Severe £36,800 to £61,410 In this category of fractured foot claims, the fracture will affect both heels. Or serious injury affecting a single foot. Fractured toe Toe injuries - serious £8,420 to £12,050 Will include injuries such as multiple fractured toes. Will affect two or more of the toes. Victim will be left with pain, discomfort and some level of disability. Can also include fractures to the big toe, known as the ‘great toe’. Fractured toe Toe injuries - moderate Up to £4,900 Will include a straight forward fracture to the little toe, or other toes. Fractured metatarsal Foot injuries - moderate £12,050 to £21,910 Displaced fractured metatarsal injuries. Will result in ongoing symptoms such as permanent disability. May include a fractured 5th metatarsal. If you don’t see your particular injury listed, don’t worry as it’s just a sample and we can help with all types of claims. This is the part of broken bones & fracture compensation claims that deal with pain and suffering that was caused by the accident. We have provided details of the payments made in the table in the previous section. General damages are graded depending on the severity of the injury, so, a broken finger would be paid less than an amputated finger. These are any costs that you pay out for treatment or prescription medicines. If you have any appointments at a doctor or physiotherapist that you have to travel to them you can claim back the petrol money or the cost of travelling on public transport or could cover the costs of alternative transport arrangements if you’re unable to drive while injured. If you need someone to care for you or to complete tasks that you’d ordinarily complete but can’t because of your injuries, then you could seek special damages to reimburse you for any associated costs. The final part of special damages that we’ll cover is loss of earnings. If you require time off from work and you don’t get full sick pay from your employer, then you could seek to claim back the difference in your earnings. If you need to change jobs or are unable to return to work at all because your injury is so severe then you can also ask for compensation for the future loss of earnings. When you contact Advice.co.uk we can put you in touch with a specialist personal injury solicitor which is important because they will ensure that every element of your fracture and broken bone compensation request is accounted for. Once a claim is settled you won’t be able to go back and ask for more, even if the cost is justified so it’s vital that your solicitor claims for all potential future costs. Broken bones can happen after an accident and can occur in just about any bone in the body. It can be a hairline fracture or a complete break. The bone may pierce the skin in certain breaks. With minor breaks, it is possible that you will not know, without an x-ray, that the bone is actually broken. Other signs that you’ve broken a bone are when you hear a bone crack or snap when the accident happens, you feel pain when you put weight on the injury or you touch it and you may feel faint, sick or dizzy. With minor breaks, you should seek medical assistance so that the bone can be realigned and protected while it heals. However, if an accident is more serious and involves a broken back or fractured neck then the emergency services should be contacted on 999. Some doctors use the words fracture or break in the same way but technically a fracture is a small crack (or hairline fracture) whereas a broken bone involves a complete break through the bone. A serious broken bone injury can cause other injuries and is more complicated to resolve than a fracture and can lead to longer periods of recovery. In general, broken bone injuries can usually be put right and do not have to lead to long term problems. But some more severe breakages can result in permanent damage, pain, and inconvenience. A fractured skull (which can lead to brain damage or concussion). Both limbs (such as a fractured arm or broken leg). Fractured ribs (which generally can’t be treated with anything other than pain relief). Spine. Fractured spine and vertebrae compensation amounts may be higher than other injuries. Broken hands, fractured fingers, feet, and toes. A fractured or broken wrist. A fractured cheekbone or eye socket. A broken or fractured nose. A fractured 5th metatarsal or another part of the foot. Fractured or broken pubic rami. It is possible to claim fractured and broken bone compensation in any of these instances so long as somebody else was to blame for the accident that caused the breakage. If you’re unsure then please speak with one of our team for free legal advice on whether you can claim or not. Some broken bone compensation claims can include compensation for ongoing issues as not all types of breaks can be fully fixed and can lead to long-term or permanent damage. If you are considering how much does a broken bone cost, to assess what you are owed, a solicitor will take these factors into account. Scarring (including scars caused by surgery). Increasing the risk of arthritis. Necrosis of the bone or surrounding area due to blood flow stopping to the area when the bone was broken. Pain when using the bone in the future such as walking or gripping an object. Some of these complications can have an impact on the personal and work life of the victim of the accident. Some types of injuries such as crushed bones, broken skulls, and broken backs can result in serious and ongoing complications that may mean more compensation is required to allow the victim to make adjustments to their way of life. Certain types of break or fracture can also be more serious. These include compound fractures and open fractures. Complications can occur when bones break completely and protrude into other parts of the body or internal organs (such as a punctured lung when a rib is broken) and some bones become so damaged that they can’t be put back together without the use of pins, plates, screws, and wires which can have a detrimental effect on the patient over the long term. It’s important to note that, if you were to blame for your accident, even if it occurred on somebody else’s property, then you wouldn’t be eligible to make a claim. If you caused your own broken nose or broken hand, you would not be able to seek compensation for the injury. Advice.co.uk can only connect you with a personal injury solicitor if the accident that caused your broken bone was caused by somebody else’s mistake, negligence or lack of action. If you want to make a claim for broken bone compensation and you believe somebody else was to blame, then speak with us today for further advice. Try to photograph the scene of the accident and include the root cause if possible before the scene is cleaned up or the problem that caused the accident is rectified. Photograph your injury. Try and get a photograph of the break or fracture. A fractured arm or fractured leg might be easier to see on camera than other types of injury, but photograph it for documentary evidence. Seek medical advice from a doctor or hospital so that you receive the right treatment and so that medical records are created which detail the injury and the treatment received. These records can be used as evidence to base your claim on. Gather statements or contact details from anybody who saw the accident happen. Report the accident if it took place in a public place such as a workplace, shop or restaurant. Ask for a copy of the accident report book entry with details of your accident happening or take the name of the person you reported it to. Keep any receipts that prove that you were out of pocket, such as travel tickets or medical bills. If you take these steps, then your personal injury lawyer will have a much better chance of securing you the compensation that you deserve. If your broken bone happened in an accident at work, then you may be able to make a fractured bone compensation claim against your employer. All staff are owed a duty of care by their employers under the Health and Safety at Work act and all workplaces should be a safe working environment. You, or another member of staff that caused your accident, weren’t properly trained in the task that led to your accident. If you weren’t provided with safety equipment or it was inadequate. If machinery or equipment was damaged or not maintained properly and that machinery led to your accident happening. You may also be able to claim if you, or another member of staff, were not allowed sufficient rest breaks and your tiredness led to your accident. Employers are not allowed to prevent you from claiming or allowed to discipline you, provided that your claim is honest, and they are required to have insurance in place to cover such claims. So, don’t be put off from claiming if you genuinely believe your employer could have prevented the accident from happening. Your accident could happen in other public places, besides the workplace, and you could still make a successful claim. Any local government owned public place (street, park, library etc). The types of accidents that can lead to broken bones include: Slips and trips, items falling on to you, car accidents and assaults and all of these would be eligible for a claim if the operator of the public place failed to protect you in any way. As with other countries, the UK has strict time frames for making personal injury compensation claims. It is advisable to speak with us as soon as possible following an accident as it would be a shame to miss out on compensation purely because of a technicality. When you’ve completed the evidence gathering, as described above, and decided that you want to make a claim you should contact Advice.co.uk to begin your claim. The process is a pretty straightforward one. First of all, we’ll discuss your claim with you, assess your injuries and the cause of the accident and provide you with advice on how strong your case is. If we are able to take your case on we can start to answer questions such as “how much compensation will I get for a broken ankle“? Our team are specially trained in legal practices and can advise you if your case is likely to be successful. If it is, we’ll put you in contact with a no win no fee solicitor who will be able to begin your claim for you. We work exclusively with our panel of no win no fee solicitors because our clients tell us it takes away the stress and risk of making a claim. No win no fee solicitors have to work in exactly the same way as solicitors who charge by the hour, but you don’t have to pay them anything up front. 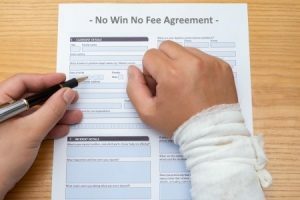 When they take on your case, they’ll provide you with a no win no fee agreement for you to sign. In the agreement will be a fixed percentage of your compensation that will be retained by the solicitor if they win your case. If they go on to win, and compensation is awarded for your injuries, then they keep the agreed percentage and then send the rest of the compensation directly to you. In fact, you never have to send a payment to them at all. If they lose, you don’t pay them and if they win then the compensation is sent to them first and then forwarded on to you once they’ve taken their payment. If you use the other option of paying a solicitor an hourly rate, you would get 100% of your compensation if they win but you’d still have to pay them their fees even if they lost the case. In most cases, claims for fractured bone compensation are resolved out of court but, if your case is one of the very small numbers that do require a court date, then your no win no fee solicitor will also represent you in court. All of our team are friendly, professional and are driven to ensuring that clients get the full amount of compensation they deserve. They are experienced personal injury specialists and can answer any questions you may have before and during your claim. Remember that our team can offer free legal advice to you, even if you’re still not sure if you’re going to make a compensation claim and we only work with no win no fee solicitors to help reduce the risk and stress of making a claim. We can help with any type of accident (caused by somebody else) from accidents at work to trips and falls in a public park so please get in touch with us today if you would like to know if your accident is eligible for compensation. Car Accident Claims Advice Guide – Have you suffered fractured or broken bones in a car accident? If so this guide will explain what is involved in claiming compensation for injuries from a car accident. Broken Bones Guide – A guide by the NHS regarding broken bone symptoms, treatments, and complications. Health and Safety at Work Act – The act that protects all employees in UK workplaces and gives grounds for making compensation claims for accidents at work.